A new study, conducted by Lawrence Berkeley National Laboratory, US, revealed that the potential for on-shore wind energy deployment is far higher than the official estimates (about 20 times and up to 30 times greater than the current government estimate of 102 gigawatts) in India. 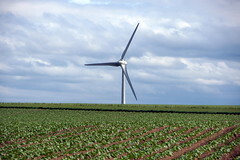 The Berkeley Lab study undertook a systematic assessment of the availability of land using GIS data on topography and land use and found a significantly higher availability of land that can potentially be used for wind power development, which is the primary reason for the higher potential estimates. The new study found the total techno-economic wind potential to range from 2,006 GW for 80-meter hub heights (an indication of how high the wind turbine stands above the ground) to 3,121 GW for 120-meter hub heights. According to Amol Phadke,lead author of report” The cost of wind power is now comparable to that from imported coal and natural gas-based plants, and wind can play a significant role in cost effectively addressing energy security and environmental concerns”. This entry was posted in Alternative Energy, GIS, India, Winds. Bookmark the permalink. While wind power is less destructive to the environment than coal, oil, or natural gas — it does kill many thousands of birds. This is an important issue to work on so that wind mills can be designed that do not kill birds. Thanks Santosh.You Are Absolutely Right.